From the high point of the narrow Alpine Loop near scenic drive near Mount Timpanogos, a relatively wide side road (FR 114) sweeps eastwards down a forested ridge and into the scrubland below, descending 1,500 feet over 6.5 miles to Cascade Springs - a large, dispersed water source with several streams that pour down a gently-sloping hillside via a beautiful series of cascades, pools and terraces of travertine, a microcrystalline form of limestone. The road then becomes unpaved and continues to Wasatch Mountain State Park near Heber City, although the main entrance to this popular preserve is from the east. The state park is open all year, offering camping, hiking, horse riding and golf plus skiing and snowboarding during winter. 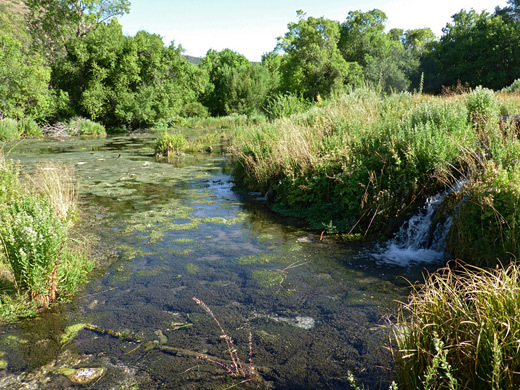 The springs produce over 7 million gallons of water per day, and are sustained by rainfall and melting snow, which seeps below ground, percolating through thick deposits of glacial sediment, then re-emerging at the boundary with an impermeable layer of ancient quartzite. When underground, the waters dissolve calcium carbonate, and this is precipitated as travertine around the cascades, as a result of a decrease in solubility induced by lower carbon dioxide concentrations. 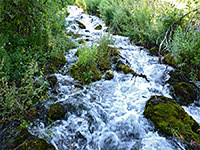 Below the springs, the waters soon join Provo Deer Creek, greatly enhancing its flow. All this area is part of the Uinta National Forest. 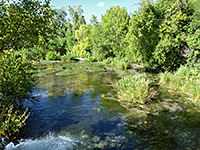 The main trailhead at Cascade Springs is right at the end of the paved section of the road, beside the woodland that encloses the riparian area. 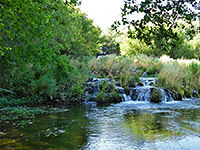 From here three interlinked loop paths criss-cross the pools and streams, in places on raised boardwalks above the ponds with their clear water, travertine terraces and a variety of lush plant life. Perhaps the most striking of the many wildflower species is golden columbine, which is found along the margins of the creeks and pools; peak blooming months are June to September. The lowest section of the trail is wheelchair accessible. 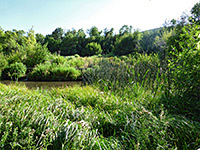 The ponds contain abundant fish (cutthroat trout), while otters, beavers, elk and deer may occasionally be seen. Further up the slopes the path follows the gushing whitewater streams that feed the lower pools and curve all around a small, very shallow lake that provides the main source - here the water seeps up through a thin part of the layer of glacial debris that fills the valley at this point. The water is generally free of bacteria and fine to drink, but this is not encouraged. About 30 minutes is sufficient to explore all the trails, and there are many places for quiet contemplation of the watery scenery. 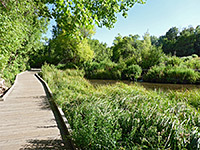 Another path (0.3 mile) connects the upper part of the loop with an alternative trailhead, half a mile back along the paved road.